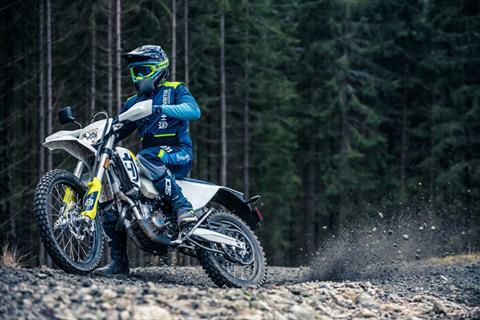 The FE 250 is the smallest capacity 4-stroke in the enduro line-up. The small capacity means it is very lightweight and shines in tough technical terrain while delivering a torquey and manageable 4-stroke performance. 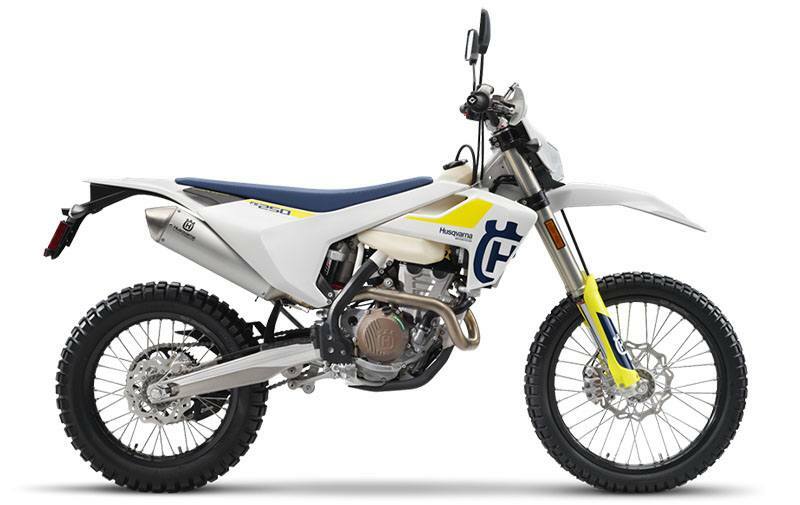 Combined with class leading WP suspension, Pro Taper handlebars and Magura hydraulic clutch, the FE 250 features an array of premium components for unsurpassed quality and reliability. ENGINE: The 250cc engine is designed to be powerful, light and compact. All major components and shaft arrangements are carefully positioned to best suit the performance and handling characteristics of the overall package. 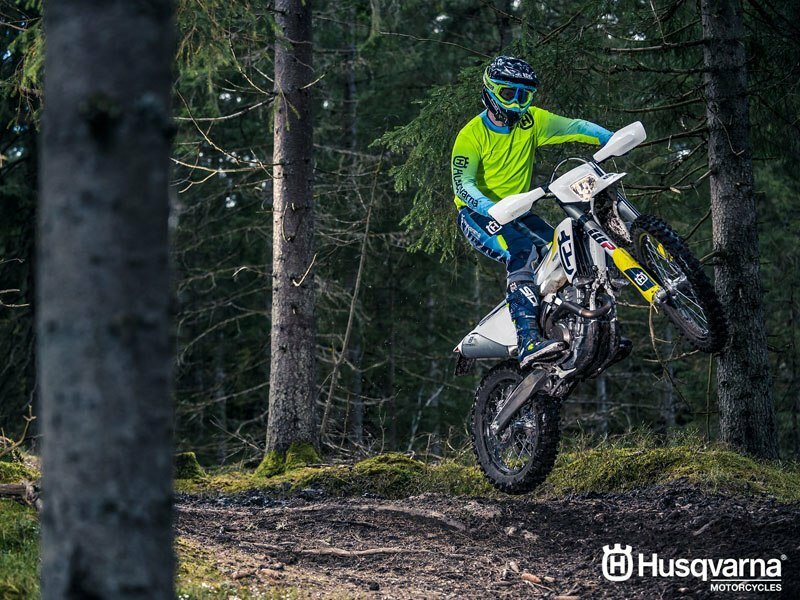 As a result, the engine weighs only 27.6 kg while retaining its torquey nature making the FE 250 accessible for both professionals and amateurs. CYLINDER HEAD: The cylinder head features advanced technology aimed at reducing weight and drag. As a result, the twin overhead camshafts rotate on a low friction surface while the four lightweight titanium valves (intake 32.5mm, exhaust 26.5mm) are actuated by finger followers using a DLC (diamond like carbon) coating. CRANKCASE: The FE 250 engine is designed to be compact while centralising rotating masses. As a result, the crankcases are engineered to house the shaft arrangements at the ideal centre of gravity. The casings are manufactured using a high-pressure die cast production process, resulting in thin wall thickness while retaining exceptional reliability. 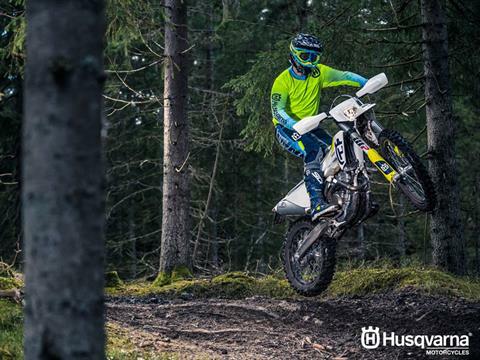 The iconic Husqvarna logo adorns the bronze finished crankcase covers. CRANKSHAFT: The plain big end bearing features two force-fitted bearing shells ensuring maximum reliability and durability, guaranteeing long service intervals of 135 hours. MAGURA BRAKING SYSTEM: The high quality Magura braking system is designed to odder high sensitivity for a modulated feel while delivering the highest level of performance. 260 mm disc front and 220 mm rear. PRO TAPER HANDLEBAR: The Pro Taper handlebar is second to none for function and style. Manufactured to exacting standards, the Pro Taper handlebar features class-leading fatigue resistance while adding minimal weight. The Pro Taper logos are chemically applied and are scratch and peel resistant. ELECTRIC STARTER: A standard electric starter guarantees easy starting in all situations. The system is powered by a lightweight and powerful Li-Ion battery which is 1 kg lighter than conventional lead battery. 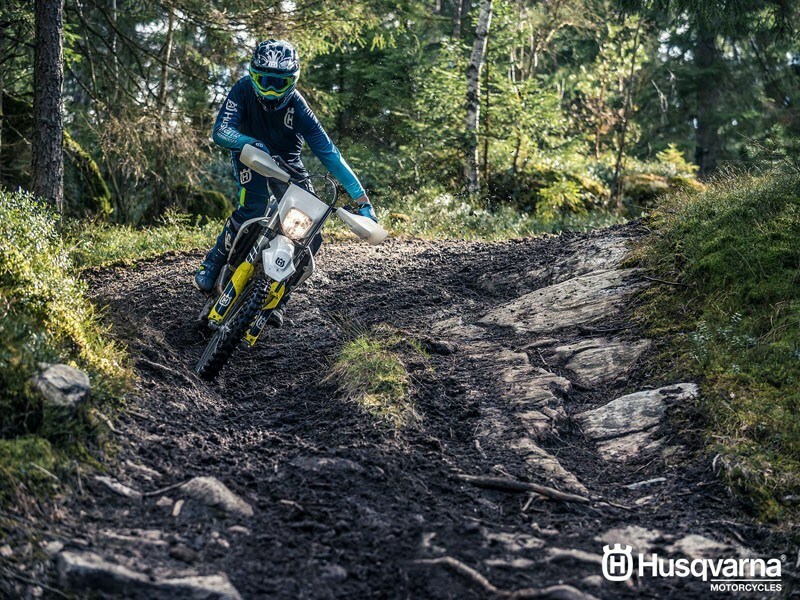 SELF CLEANING FOOTPEG MOUNT: The Husqvarna frame features a clever, self -cleaning footpeg mount which prevents the build-up of dirt collected through deep ruts or muddy terrain. As a result, the footpeg will spring back into its original position ensuring perfect control. The large aluminium footpegs have an Enduro specific grip pattern while the position of the pegs is 6mm higher than that found on the MX models to further increase ground clearance over rocks and deep ruts.